During quantum condensation, microscopically small particles with different energy levels merge into a single macroscopic state. In such a state individual particles can no longer be distinguished so that the material can be regarded as a 'superparticle'. Back in the 1920s, Bose and Einstein predicted that particles at very low temperatures would form such a condensate. Only in the 1990s was the existence of a Bose-Einstein condensate confirmed experimentally, by cooling down gas atoms to just above absolute zero (-273 degrees Celsius). The exact condensation temperature is dependent on the mass of the particles: the heavier the particles, the lower the temperature must be before condensation occurs. So for quite a long time scientists have been searching for extremely light particles that can condense at room temperature. Researchers from FOM institute AMOLF and Philips Research have now made a new type of particle that could be a candidate for quantum condensation at room temperature: the extremely light plasmon-exciton-polariton (PEP). This particle is a hybrid between light and material particles. It consists of photons (light particles), plasmons (particles from electrons that vibrate in metal nanoparticles) and excitons (charged particles in organic molecules). By coupling photons, plasmons and excitons in a special way, researchers have created PEPs with a mass that is one trillion times smaller than the mass of atoms. Thanks to their small mass, PEPs could make quantum condensation at room temperature possible. PEPs are largely made up of photons, so their decay will be associated with the emission of light. That light has unique characteristics, which makes it suitable as a basis for new optical devices. FOM institute AMOLF and Philips Research have recently made improvements to white LEDs using similar systems. Schematic representation of the system investigated. 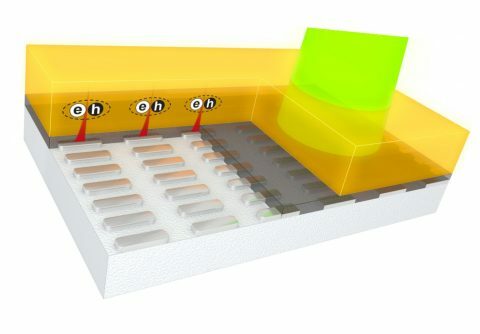 A structure of silver nanorods is covered with a thin layer of silicon nitride (grey) to counteract oxidation and with a thick layer of polymers and organic molecules (orange) that emit light. The light field of the nanorods (red) links to the molecules (the letters e and h within the ellipse) and thereby forms the plasmon-exciton-polaritons (PEPs). By increasing the PEP density researchers saw that they effectively cooled down, which opens up the door to quantum condensation.